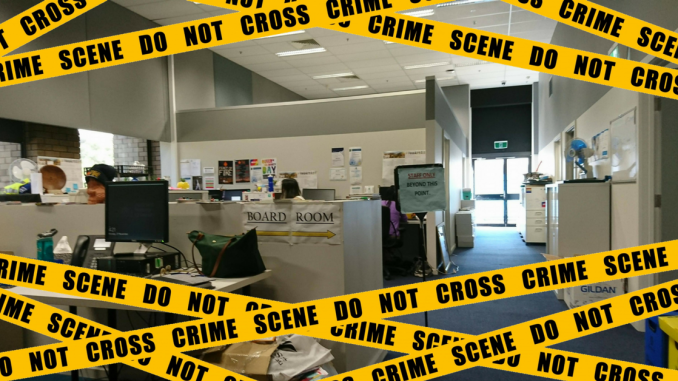 The ANUSA and PARSA offices were broken into last night. Property was damaged, but there is yet to be confirmation of what, if anything, was stolen. Damage to the offices was discovered this morning. It appears that the glass back door, leading into the offices from the south side of the Melville Hall building, was smashed, and multiple computer monitors were destroyed. Observer understands the damage is currently believed to have been carried out by a single assailant, rather than a group. ANUSA President James Connolly told Observer that “the Library kindly made private space available for meetings” in the morning, but that “as of 12 we have reopened and are fully functioning again including student assistance and legal”. By 4pm the broken monitors and computers had been replaced, and broken glass cleaned up and boarded over. Police are looking into the matter. Observer understands that CCTV cameras in the area may have recorded the incident.